This interesting little area I visited is home of the Yazidi faith in the Nineveh province of Northwestern Iraq. I had the privilege of living and teaching in the Kurdish region of Iraq two years ago. Before the beginning of ISIS and the reign of terror they hold over the world and this gorgeous country of Kurdistan. I had the pleasure of visiting this remote village in the North; a region that not many will ever see again in such an intact state. Here is what I learned about this group of people while on my wanders in Iraqi Kurdistan. The Yazidis believe that God created the earth and left its ruling to seven angels or holy beings, the chief of these beings is Melek Taus. This archangel has a second name, Shayton, this same name is listed in the Koran and means Satan. This has led people to believe that followers of the Yazidi faith are Satan worshipers. The story goes that Melek Taus did not submit to Adam, while everyone else did. He did not submit because he was instructed by God that he was the ruler and lord on Earth. Melek believed that this direction from God gave him the power to choose whether or not to submit to Adam. The Yazidis believe that both good and evil exist inside of everyone and that we have the power to choose the way we want to live. This choice makes us human. Members of the Yazidi faith celebrate this while members of the Muslim faith believe that Meleks non submission to Adam caused him to fall out of grace with God and resulted in him becoming Satin himself. We entered Lalish in the early afternoon. Our Taxi driver, a devout Muslim was appalled and disgusted by our interest in visiting members of the Yazidi faith. His distaste for our location was cemented when we were asked to remove our shoes before entry into the town, a big no no in the Muslim faith. It sparked a bit of humour in the group to watch his reactions as we toured around the town. The best for me was when he spotted the local Yazidis making oil for their lamps. This is an old process which involves placing a large number of olives in an old rice sack. The sacks are placed around a set of railings and a central pool. Off to the side are large pots of water which are heated. 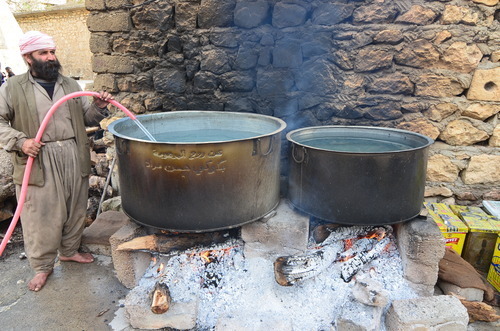 The water from these pots is poured over the sacks of olives to soften the olives before the oil is extracted from them. None of this was particularly dirty or gross, until the men started to stomp on the sacks with their bare feet. Again, the foot thing seemed to severely disturb our taxi driver friend. But a very interesting sight for us, and apparently not a very regular occurrence in the town, so I was pretty happy that we were able to see it in action.